Apple to Double Processing Power of Future iOS Devices? Mark Gurman at 9to5mac is reporting the discovery of evidence suggesting quad-core chip inclusion in upcoming iPads and iPhones based on digging deep into the iOS 5.1 beta. The original iPad contained the A4 processor, clocking in at 1 GHz. With the iPad 2 came the ‘made in Texas’ A5 processor offering a dual core chip and the speeds to go along with it. 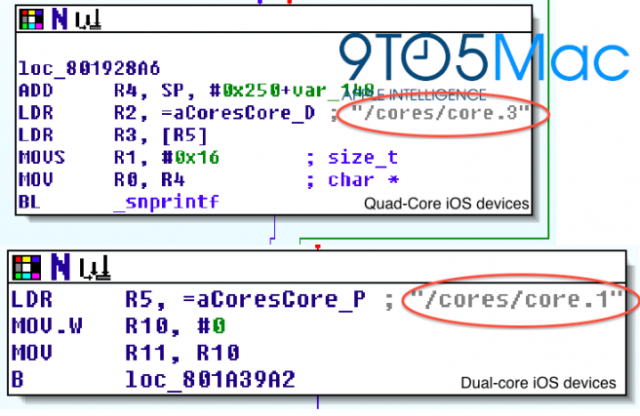 With the beta release of iOS 5.1 certain discoveries have been made that offer convincing evidence that the next processing chip (likely to be called the A6) will be quad-core. This is suggested by a few particular mentions in the update specifically referencing the option of “/cores/core.3”. What does that mean? By the proposed labeling system, the reference to “core.3” would equate to a fourth core. Further evidence resides in the fact that the iPad 3 is currently being tested using the iOS5 beta software. A quad-core processor would without a doubt take the power of hand-held Apple products to new heights with possibilities as vast as high-performance gaming to professional level software such as a rumored Final Cut Pro for iOS. As well, more processing power would lead to peppier basic tasks from taking photos to using maps. What would you use all that processing power for? Angry Birds?